Polly Trixster writes: The right to vote is an important one and even when the choice seems utterly appalling, electors have the power to say so. A final alternative when voters perceive their choices to be completely unelectable is the “none of the above” option. Deliberately spoiling a ballot has an important part to play in democracy and can send a much more powerful message to the authorities than simply not showing up. While a low voter turnout sends a message of general apathy, politicians can excuse their own culpability in putting people off the democratic process when they don’t vote by speculating about the reason and blaming other random causes, from the weather to a flu bug. But when voters spoil their ballot, the elector can write on that paper exactly why they are not choosing any of the above — and the candidates can see it. The numbers also tell their own story when it becomes a significant amount. Given the change to Cayman’s political system for the 2017 General Election, the supervisor of elections has confirmed that deliberately spoilt ballots will be formally documented in the constituencies this election. And as the politicians will be there for their counts, they will see very clearly the voters who have chosen to send the message that the calibre of candidates was not good enough. A significant percentage of deliberately ruined ballots can make an impact and send a message to party leaders or members of alliances that their choice of running mates was not up to scratch. On the other hand, a low number offers legitimacy to the process, showing voters do have at least some faith in some of the candidates. Not voting at all, however, is no solution to improving the quality of our elected leaders. Given that the right to vote has been hard-fought and continues to be a hard battle for many people around the world, spoiling a ballot is far better than missing the chance to have your say. Many scholars now see spoiling ballots as a genuine form of political expression. There have been numerous campaigns in Europe in recent years that deep discontent with the political offering can be delivered effectively through the spoilt ballot. If the numbers are significant enough, “none of the above” can be as powerful a democratic position as voting to return a candidate to office. While both leaders of the parties here in Cayman have claimed their teams are full of stellar candidates, we all know that’s not true and any voter who feels that way needs to say so rather than stay away from the polls. The independents who have aligned themselves into ad hoc groups also need to know from the voters that they see through the cynicism of their friends of convenience helping them on the road to a big green leather chair. Anyone who deliberately spoils a ballot as an alternative to not voting at all is making much better use of their democratic right than just not taking part. In an ideal world when it comes to voting, we all want someone on the ballot that we can vote for in the satisfaction that we believe they will make a positive contribution, but it isn’t always the case. Staying away leaves the door open for the mediocrity to continue. Not voting is undermining democracy in many western nations as people claim their vote doesn’t make any difference. But it does; it’s not voting that ensures the status quo. Cayman has a great record when it comes to voter turnout compared to many other countries, which is important given that half of the working adult population cannot vote. Hopefully tomorrow, which is an historic election, will see an historic turnout as well. But for those voters who believe their candidate choice is so bad they plan to give the polling station a wide berth, it’s worth considering that it only takes a few minutes to vote, and telling the politicians what you really think might prove to have more value than despondent voters realise. Is it just me or is this really flawed advice? 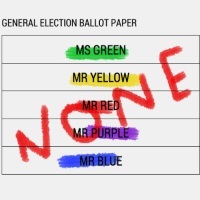 Good in theory, but which elected member is going to turn behind and consider the not so subliminal message of some spoiled ballots? Except the candidates do not see the ballots. The officials counting the ballots simply say “spoiled ballot” and continue the count.